Simon Gauzy will make his final debut tomorrow night on the Gold Coast, while Vladimir Samsonov continues to surprise everyone including himself Down Under. Simon Gauzy (FRA) has moved in to his first ever Men’s Singles World Tour final after he defeated Cho Seungmin (KOR) 4-2 at the Seamaster 2017 Australian Open. Gauzy flew out of the gates and took the first three games 11-5, 11-6, 11-6. It was looking like a 4-0 whitewash, but Cho had other plans. The fans were suddenly thrown in to the middle of a thriller. Cho stole the fourth 11-9 and in the fifth game Gauzy had match points when leading 10-8, but four consecutive points went the Korean’s way. With the scores level in the sixth game at 10-10, the word no sportsman wants to hear was being whispered around the stadium; was Gauzy going to choke? But French fans could breathe a sigh of relief. Gauzy sealed the match, winning 15-13. The other man to make his way to the final is none other than Vladimir Samsonov (BLR). Vladi took down Paul Drinkhall (ENG) in style, with just one game being dropped. The Belorussian is surprising himself at this tournament, not expecting to be in such good form. Now in the final, Samsonov finally has to admit another title is a real possibility. He could soon be adding another trophy to the mantle. And how about his record for most World Tour titles and the thought of Ma Long overtaking him? 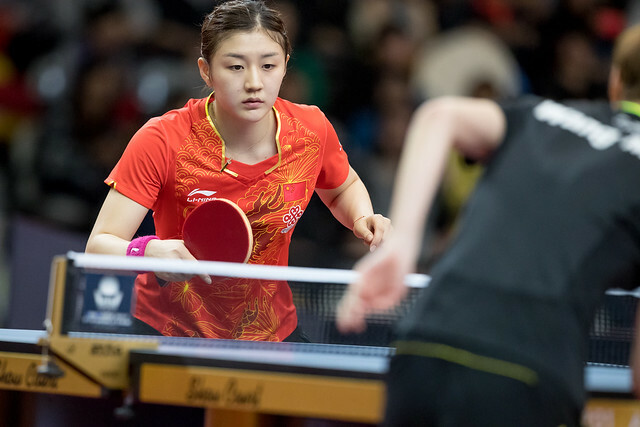 Catch the all the action from the finals live from 18:30 local time on tv.ittf.com.